The IIF file contains one journal entry for each day in the Date Paid From and Date Paid Through as defined when generating the file. The debits in the entry are the monies you have taken in and the credits are the revenue accounts associated with those payments. Point to Tools and select QuickBooks Desktop Export. Select the desired Location(s) or leave blank to include all. Enter the range of dates to export in the Date Paid From and Date Paid Through fields. Show Refunds is defaulted to Yes. Change this to No if you do not want refunds included. Click Download IIF File. Note: This button will be grayed out if you have not given every Category 1 a corresponding QuickBooks account. Click the link in the warning to Assign/Edit QuickBooks Accounts. 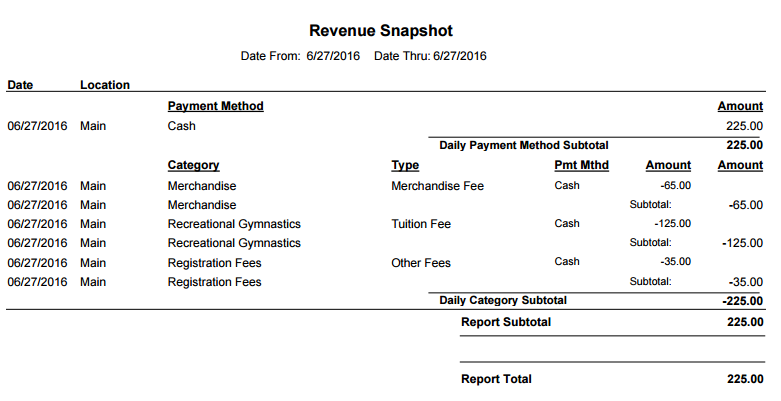 Click Revenue Snapshot from the left menu to generate a report showing the daily summary of revenue by payment method and Category 1. This can also be used as a source to manually enter a journal entry into your QuickBooks if you opt not to use the IIF export/import or if you are using the online version of QuickBooks and need to break out taxes.